The aim of this study was to determine the effect of increasing estrogen and decreasing androgen in males and increasing androgen and decreasing estrogen in females on bone metabolism in patients with gender identity disorder (GID). We measured and examined bone mineral density (BMD) and bone metabolism markers retrospectively in GID patients who were treated in our hospital. In addition, we studied the effects of treatment on those who had osteoporosis. 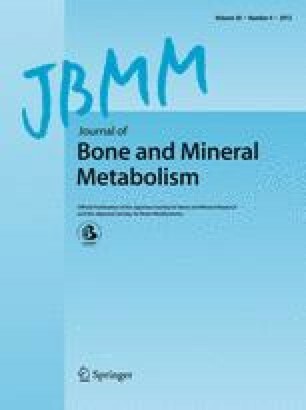 Patients who underwent a change from male to female (MtF) showed inhibition of bone resorption and increased L2–4 BMD whereas those who underwent a change from female to male (FtM) had increased bone resorption and decreased L2–4 BMD. Six months after administration of risedronate to FtM patients with osteoporosis, L2–4 BMD increased and bone resorption markers decreased. These results indicate that estrogen is an important element with regard to bone metabolism in males.